Asian markets surrendered Monday’s gains amid fears of recession on the back of recent pathetic US and China economic reports coupled with Euro zones sovereign debts crisis, despite 11th-hour deal by U.S. lawmakers to raise the US debt ceiling. Tracking the regional sell down, FBM KLCI lost 3.2 points to end at 1554.9. Trading volume decreased to 904 million shares worth RM1.44 billion against Monday’s 1.01 billion shares worth RM1.45 billion. Lagging movers were TENAGA (-9 sen to RM6.12), PPB (-30 sen to RM17.28), CIMB (-3 sen to RM8.39), YTL (-3 sen to RM1.42) and PBBANK (-4 sen to RM13.42). Market breadth was negative with 307 gainers as compared to 496 losers. The lack of positive domestic catalysts, overnight 2.2% plunge on Dow and renewed concerns over the worsening global economic growth and Eurozones debt crisis are likely to haunt investors’ sentiment in the near future. As the external market sentiment has deteriorated recently, we have toned down our near term positive market outlook to neutral. 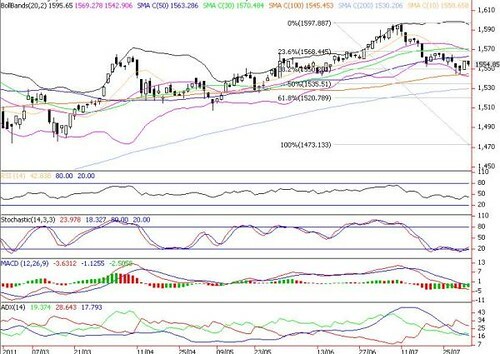 Taking cue from the wild swings in the external markets and discouraging economic reports, the KLCI is likely to retest lower downside supports of 1545 (100-d SMA), 1536 (50% FR) and 1530 (200-d SMA) this week. Immediate resistance are 1558 (10-d SMA), 1563 (50-d SMA) and 1570 (30-d SMA) points.